BiblicalEthic.org - Hobson's Biblical Choice Blog - The Book of Abraham: How Good Was Joseph's Translation? It was thought that the Book of Abraham papyri had been lost. But then they reappeared in 1967 at the Metropolitan Museum of Art in New York, from which the LDS church obtained them. Now, Joseph’s translation could be tested. The results could help confirm Joseph’s ability to translate the Book of Mormon as well, although no one possesses the golden plates which Joseph claims to have translated. The results proved to be an embarrassment. The text turned out to be a pagan Egyptian funeral text from approximately the 1st century AD, almost 2000 years after Abraham. Several scholars, both LDS and secular, made translations that agreed with one another. These translations reveal that for every one Egyptian word in the text, Joseph had anywhere from 50 to over 150 words in his translation, including 178 words for the name of the Egyptian deity Khons (the entirety of Abraham 1:16-19). In his own translation of the Egyptian text, Nibley himself could not evade the truth about what the papyri text actually said. So he spent years of his life and work trying to find an alternative way to understand the Book of Abraham and its connection (or lack thereof) to the text that Joseph had claimed to have translated. 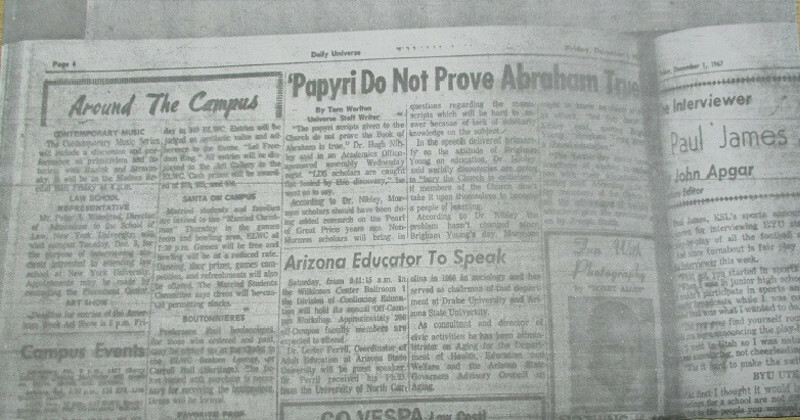 He eventually published his conclusions in his book The Joseph Smith Papyri: An Egyptian Endowment. If I were die-hard LDS, I would probably resort to Nibley’s explanation. But for me, and for anyone who is more committed to the honest truth than to any ideology, the truth about the Book of Abraham would be like (theoretically) digging up the bones of Jesus: proof that Joseph did not have the faintest idea what he was translating, and indirect proof that none of his translations were from God, including the Book of Mormon. For me, here is solid proof that Joseph was a deceiver, a false prophet. The truth about the Book of Abraham is a major piece of what keeps me from getting sucked in by the attractiveness of the LDS church. I have spent 41 years studying the LDS people and their story. I find them fascinating, and I have a great burden in my heart for them to know the truth, both about Joseph, and about Jesus. If any LDS person asks me the Golden Question, “Why haven’t you become one of us?”, the evidence on the Book of Abraham would be part of my answer. But I have no desire to take away any Latter Day Saint’s faith in all that they hold sacred. My desire is for them to transfer all of their faith onto Jesus instead of Joseph. Jesus is the truth who will never let you down. You were never wrong to place your faith in him! The bedrock truth of Jesus’ resurrection endures when all other claims of faith on the market collapse. And faith in his saving death on the cross is the only way you can know for sure that you have been saved from your sins and eternally put right with God.